With the label "Noble", tennis has always been regarded as the sport for the group of upper middle class, but nowadays it has entered into ordinary families. Finished last Sunday, 2015 Tianjin Amateur Tennis Master Competition is the second edition for Tianjin Open organizing committee to hold this game. 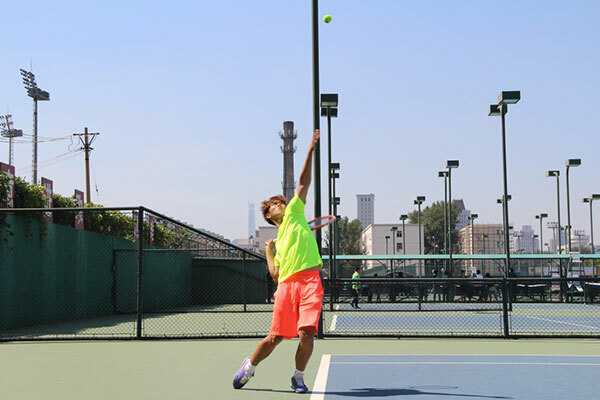 The first edition of Tianjin Amateur Tennis Master Competition was held successfully last year, which offered local amateur tennis players a chance to close contact with world-class tennis stars. 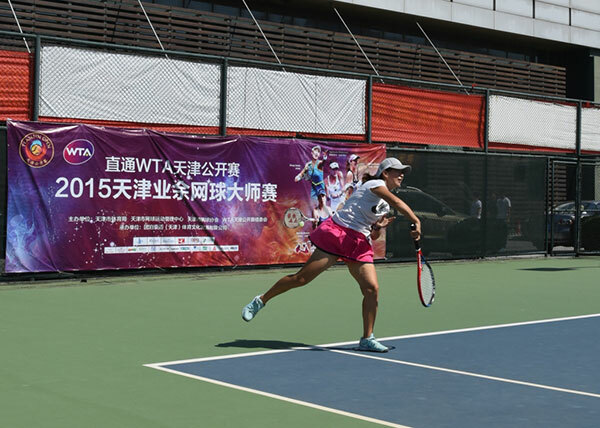 This year's competition has been upgraded by WTA Tianjin Open organizing committee with increased prize money for the winners, which attracts over 400 Tianjin local tennis enthusiasts come to sign up the event. There are 5 groups for players, which are, Children Group (14 years old or younger), Teenager Group (18 years old or younger), Youth Group (19 to 45 years old), Evergreen Group (45 years old or elder), and Women Group (19 years old or elder). Zhou Bing/ Dai Tingting, winners of Women Group Women's Doubles. Tianjin female tennis team has led the domestic tennis for over ten years. Moreover, lots of Tianjin local tennis player such as Peng Shuai, Duan Yingying, Liu Fangzhou, and Wang Qiang also always receive good results at international events. We do have the excellent sports achievement and highly involved tennis atmosphere, but only lack of a bridge in Tianjin. 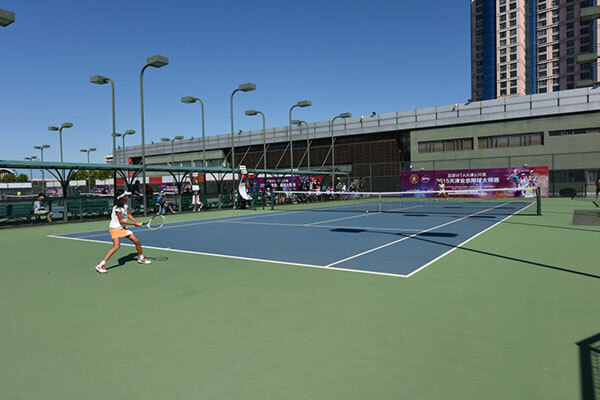 For this purpose, "Directly Go To WTA Tianjin Open" has been regarded as a more profound theme of the 2015 Tianjin Amateur Tennis Master Competition, which means the seamless connection between amateur tennis and professional tennis, and enhance the combined development between popular sports and competitive sports. The winners in each group not only can use the prize money to buy the tickets of 2015 WTA Tianjin Open, but also watch the fantastic performance of numerous superstars for example Agnieszka Radwanska, Karolina Pliskova, Martina Hingis, Belinda Bencic, etc. Furthermore, they can also purchase their favorite tennis equipments on site during the tournament. After the match, the silent girl Hu Shuyun (winner of Teenager Group Women's Singles) as a third grade student of Junior Middle School looks quite different with her ambitious passion on the court. She began to learn tennis since her third grade in primary school. Last year, Hu Shuyun and her parents visit Tianjin Tuanbo International Center during the first edition of Tianjin Open. "Watching so many high level players participation, I hope that one day I could stand at such a professional court to play tennis" As Agnieszka Radwanska will join Tianjin Open this year, Hu Shuyun enthused, "She is my idol, so I will go on-site to watch her playing tennis, and cheer for her. I wish I could play tennis as well as her when I grow up". The tall pretty boy Meng Hong is the winner of Teenager Group Men's Singles. As a swimming enthusiast, he likes Roger Federer by a coincidence, since then, he began to practice tennis. Now he is a second grade student at Senior High School, and still takes 3 or 4 times every week to play tennis. When talking about the players of Tianjin Open this year, Meng Hong smiles, "I like Federer most, only him, so I hope that Tianjin will hold ATP tournament in the future, and wish that Tianjin will also come to Tianjin. I will certainly watch the US Open Finals overnight to cheer for him". Dai Tingting as one of the winners in Women Group Women's Doubles is a new mother. Since she was always sick at childhood, she started to practice tennis at the age of 10. Later, she was selected to the national soft tennis team. Now she comes back to Tianjin University of Sport as a teacher of tennis and soft tennis, "Tianjin seldom held this kind of amateur tennis competitions before. This is so meaningful that make us learn more about Tianjin Open, and motive our passion to pay attention to the tournament, and pay attention to tennis." Tingting says, she will not only go to visit Tianjin Open with her whole family next month, but also encourage her students to participate at the Tianjin Amateur Tennis Master Competition next year."